In the wake of last week&apos;s musing about the ill-fated Chicago Spire designed by Santiago Calatrava, the good folks at architecture and engineering firm Epstein reminded me of an earlier unbuilt Calatrava project: in Chicago: The Queen&apos;s Landing Bridge. 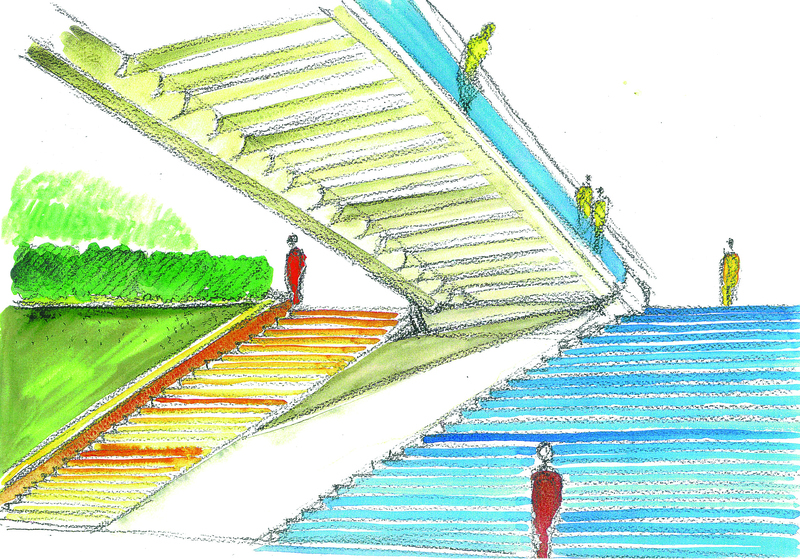 Proposed in 2001, twin cable-stayed pedestrian bridges would have crossed Lake Shore Drive at Buckingham Fountain, allowing people and cyclists to connect to the lake at one of the most critical points. Epstein was picked for the project and brought in Calatrava. "I think the design is quite beautiful," remembers Epstein Director of Design Andrew L. Metter who worked with Calatrava on project. "I think it really would have enhanced the connection between the city and the lakefront, but it also would have been an architectural landmark that would have been quite appropriate." Snagging Calatrava was a coup, particularly in 2001 as the architect, strtuctural engineer and artists was gaining international fame with dramatic, harp-like bridges were being envied (and copied) around the world. So what happened to the bridge? In short, then-Mayor Richard M. Daley couldn&apos;t be sold on it. I was a mayoral deputy chief of staff then who was part of a team advising the mayor on the project in the spring of 2001. Daley was concerned about the expense of the bridges and whether the structures were so elaborate they would block views of the lake. And given the city&apos;s still astonishing decision in 2005 to erect snow fences at that crossing, the mayor, for a while at least, wasn&apos;t convinced people should cross there at all. Thankfully the snow fences disappeared and the city has quietly entertained other proposals for Queen&apos;s Landing overpasses or underpasses. But not the Calatrava design. Calatrava lobbied hard for the project and sent the mayor a bound book of watercolor paintings he did detailing the project (Why didn&apos;t I swipe that book for myself when I had the chance?). And I arranged a meeting between the two in Daley&apos;s office in 2002 in which they talked about the potential of other bridge projects--but not this one. "Now there is a movement to see infrastructure as multifunctional and as [being able to support] alternative means of transportation ... and being part of a larger network of transportation," Metter said. "This connects to the bike paths, pedestrian paths. This would have been one of those early pieces."